I checked into my hotel room at 1:15, two hours earlier than the appointed check-in time, but I was relieved. I had become sick on the train and wanted nothing more than to nap for an hour before venturing out to explore the city. One hour turned into four, and by six o’clock I was awake but in no condition to explore. I wanted to continue sleeping, but I felt guilty at wasting one of my only two days in Wakkanai, so I forced myself to get out of bed and see something before nightfall. Not feeling well enough to dine out, I walked back to the station where I found a Seicmart, and I bought some convenience store food for a picnic. With my dinner in tow, I headed to the Wakkanai Dome, a wall of roman columns protecting the city from the waves. As I approached the dome, something about it seemed eerily unfinished, like a half-built highway road with an abrupt edge that evokes so easily the image of a car driving off the brink and perishing in a fiery dive. Clearly visible from the station, the Wakkanai Dome looks like a highway jutting out into the coastline and coming to an abrupt end in the sea. As the dome nears into view, I was struck by its size. The large columns lined up the edge of the dome’s half cylinder. I walked under the refuge, feeling it was the perfect shelter from a storm. Then at the end of the walkway, I saw cobblestone steps leading to the top. I hesitated before climbing them. I was still feeling unwell and I wanted to return to the hotel soon, but I decided to walk to the top, if only to know what view it held. From the stone edge of the dome, I was taken aback by the stunning view. A perfect dusk, where the sun shot out a ribbon of rainbow on the tip of the horizon, mirrored by a deep blue on both sides. The water, ever moving, ever changing color. And the city itself, what an odd contrast. The crumbling building lining a glistening ocean. When I finally managed to peel myself away from the view, I headed down he cobble stone stepped and ate by dinner on a stone bench in the park just outside the dome. An early dusk was approaching, and by the time I finished my picnic I returned to the hotel in the purple hour of twilight. 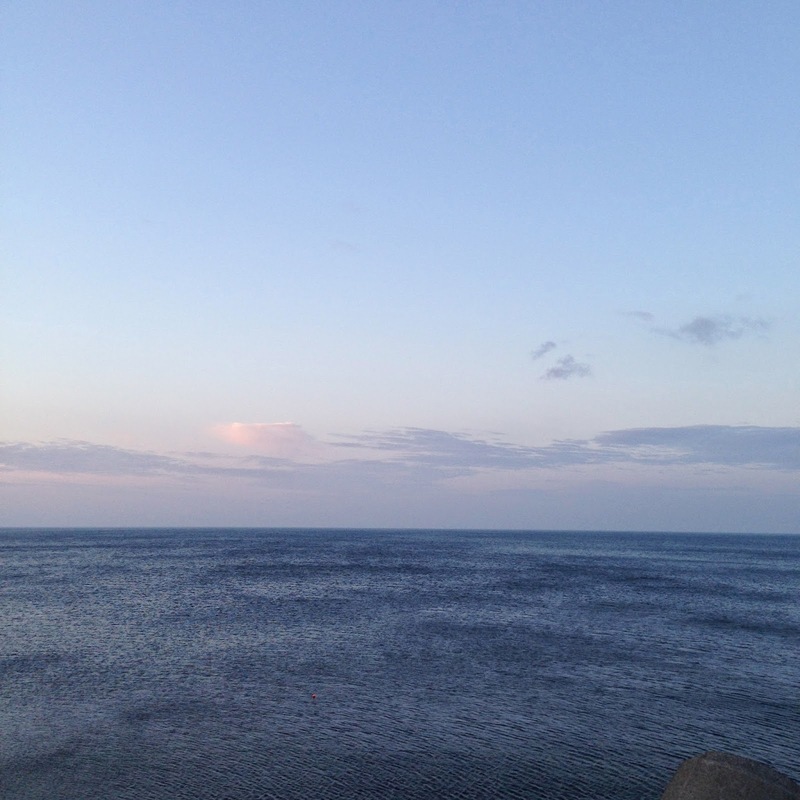 The next day after dinner I soaked in the bath at the rooftop of the hotel just before sunset, and while I was tempted to go back to my room and sleep, I felt the view of the sea pulling me to the edges of the Wakkanai Dome again. I threw on a coat and braved the cold air for that view again. As it had the previous night, the wind blew so fiercely that I felt it would rip the coat right off my shoulders. Soon I was leaning over the stone edges of the breakwater Dome, and looking upon the same scene as the previous night. But it was different this time. The wind made the seas choppy, dark slits in the water blemished its smooth surface. The sky had dark blue bruises in its polished face. Was I too late to see the perfect scene I had witnessed the previous night? Had I been a fool thinking I could look upon that same supreme view every evening? The scene I saw the previous night may have been matchless, even against future manifestations of itself. I walked away from the stone edge of the dome. I couldn't look again I wanted to remember Wakkanai as perfectly as I did that first night. As the sun set behind me, I kept the view of the ocean in my mind. And I I departed to the 7:10 am train for Sapporo that next morning, I remembered it.